Mamoru Oshii's futuristic animated masterpiece, Ghost in he Shell, is the perfect film to experience on Digital Video Disk. Seamlessly merging traditional cel animation with the latest computer grapic imagery, this stunning sci-fi spectacle has broken boundries of mainstream animation with its detailed direction and uniquely intelligent story. 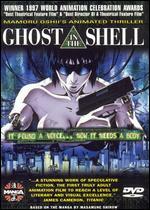 Ghost in the Shell took the world by storm in 1996, introducing a new wave of Japanese animation through its mesmerizing cinematic expression. A movie that questions our own human existance in the fast-paced world of the information age, this remarable, award-winning, cyber-tech thriller has gone on to become one of the leading Japanese animation films of all time.